Looking for the perfect Ski House or Air B&B? 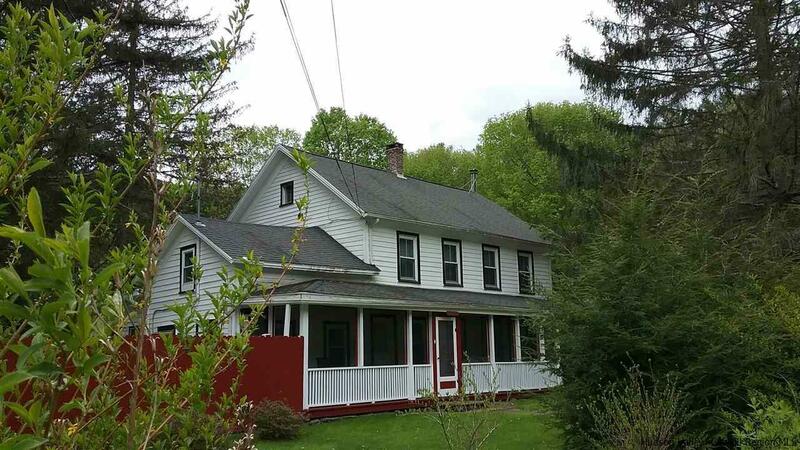 This Nostalgic FARM HOUSE in very good condition has 1.79 acres and is only 2 hours from NYC. The lovely landscaped yard borders over 150 feet of stream frontage on the Esopus Creek. PLUS a separate 700 sq. ft. GUEST COTTAGE with screened-in porch! Substantial upgrade investments have been tastefully done without compromising the feel of earlier times. Wood clapboard sided; new roof. A 44 foot, screened in, farm house porch is characteristic of the times. 1st floor exhibits exposed beam & plank ceilings throughout. Massive hand made oak table (easily seats 10), and hutch accentuates how spacious the family style kitchen is. Wainscoting & plank wall treatments with 6" oak plank floors accent downstairs areas. Convenient main full bath + bidet (all new) and master bedroom are situated on 1st floor. 2nd floor features 3 spacious bedrooms with yellow pine floors and a full bath to accommodate family, guests, ski crowd. New gas heating plant & wall heater provides comfortable environment. Wood stove adds country touch with years of firewood supply kept dry in large wood shed. The garage, originally a 2 car, is presently a combination 1 car garage and over-sized workshop. Partition wall could be removed to make garage serviceable again for 2 cars. There is a tool/garden shed; yes, formerly a 2 seater outhouse! Also, a 140 sq. ft. studio or storage building with electric. The yard has a wire fenced-in 1/4 acre pet enclosure. The 750 sq. ft. blue stone patio has a 120 sq. ft. screened gazebo. A meditative garden area with gardens plus young flowering fruit trees sets off the center of the yard. Privacy plus flowering shrubs and landscaping highlight the yard as an outdoor retreat. The separate summer guest cottage is fully functional; eat in kitchen, living room, full bath, and very large bedroom (that originally was 2 rooms and easily could be again.) Down by the creek is a stone patio where you can relax and enjoy the serenity of the beautiful water, mountains and nature. Only about 1.5 miles to the quaint town of Phoenicia where you will find Restaurants, Theater, Shops, Library and more, or take a short drive to experience Woodstock. Going West, a quick drive will take you to Skiing (Belleayre Mountain or Hunter Ski Slopes), Swimming (at the Pine Hill Lake) and the quaint town of Margaretville. This property is turn-key, ready to move-into. It is a retreat in itself, come rest, play and enjoy! Lot Block Address: 4.2,1,1305 River Rd.